Wireless home security cameras provide protection and flexibility. Ooma Smart Cam is a wireless home security camera that delivers advanced monitoring features and more. 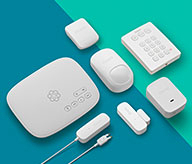 Wireless simplicity for your home. Going through a tangle of wires is never fun for any homeowner. Not only do they look messy, but they use up a ton of energy and can create hazards. That’s why it’s been a priority from day one to make Ooma Smart Cam 100% wirefree. Because of its wireless design, Ooma Smart Cam can be mounted indoors and outdoors from virtually anywhere. Because of the camera’s seamless design, there are endless home security uses and applications. 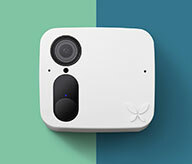 You can mount the camera on your back porch to track any outdoor activity, monitor your garage, keep a camera in your entryway to get a live view of the front door, or use Ooma Smart Cam as a nanny cam. You have multiple options for mounting your Ooma Smart Cam. Every camera is shipped with a magnetic wall mount inside. It also comes with 3 mounting screws and 3 mounting anchors for easy installation. The back of each camera also has a ¼”-20 pitch female thread which can be used with a variety of indoor and outdoor surveillance mounts. One of the biggest perks of Ooma Smart Cam is the flawless design that blends seamlessly into your home. With no cables or wires, you can place the camera just about anywhere, and it will look great in a variety of home design layouts. With no wires to maneuver, setting up the Ooma Smart Cam is very easy – many of our customers are up and running in minutes. Simply mount your camera, connect to the app, configure your settings, and you’re ready to go. Many wireless security cameras are app-based, meaning they are powered and configured by iOS (Apple) and Android devices. Ooma Smart Cam is no different. Once your settings are configured in the app you can control the camera’s settings, view live and saved timeline events, and much more, from anywhere. All of the data that is stored in your Ooma Smart Cam is saved to the cloud, meaning your recordings are safe and secure. We take your privacy very seriously. Ooma Smart Cam protects your video feed and camera access from hackers by providing top-notch security often used by banks and governments. We use end-to-end encoding for all video data with 256 Bank Level Encryption and SSL Security Certifications. Compared to traditional hard-wired security systems, wireless home security camera systems like Ooma Smart Cam are a much more affordable option. Not only do you not have to connect the Ooma Smart Cam to an outlet, you can also easily move the camera to a new location if your home security needs change. You can also take wireless cameras with you and reconfigure them if you ever need to move or relocate. There are a lot of practical, smart applications you can enjoy when it comes to wireless security cameras. To learn more about the many Ooma Smart Cam features, watch our informative video below.